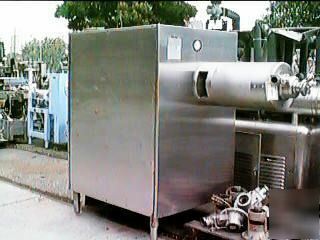 Cherry Burrell thermutator, 6" dia x 24" barrel, model 624de, scraped surface heat exchanger. Designed for 400 psi internal at 400 degrees, 200 psi jacket at 400 degrees, complete with s/st sanitary cabinet, hp drive motor, 2" inlet and outlet, last used on peanut butter. Condition excellent.